Be amazed by the Train Station of São Bento and its blue mosaics, in Porto. 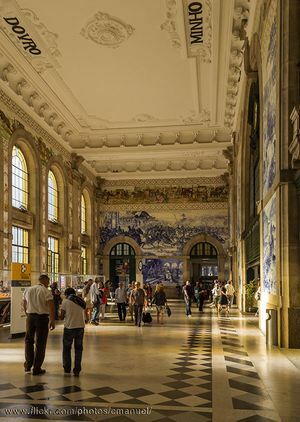 The Estação de Comboio de São Bento (Train Station of São Bento) is one of the must-visit places if you are in Porto. This station was built during the 19th century over the remains of an old convent. Its stately façade attracts passers-by, but the interior is even better, with a hall adorned with more than 20,000 hand-painted blue tiles portraying the history of Portugal. Due to its incredible location in the city centre, it’s almost certain you will go by it several times a day, but don’t just see its façade, go inside! From this station depart trains towards the vineyards and nearby towns such as Braga, Viana do Castelo, or Guimarães. Praça de Almeida Garret, Oporto.